He was born in 1997 in Moscow in the family of musicians. He graduated from the Central Music School of Moscow Tchaikovsky State Conservatory (class of the People's Artist of the USSR, Professor Eduard Grach). Currently is a student of Moscow Conservatory in the class of the same teacher. 2015 – the Grand Prix winner of International Competition "Dedication to Sergei Prokofiev" (Moscow). 2017 – the Grand Prix winner of International Competition "Violin of the North" (Yakutsk). Participant of International Festivals of classical and jazz music, permanent participant of the International Music Festival "Musica Maxima" (Croatia). He maintains the active concert schedule. 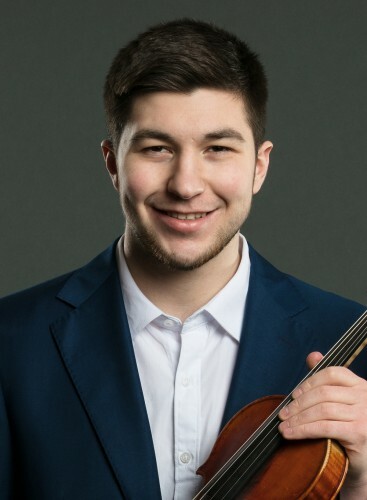 He performs in the Moscow concert halls (the Great Hall of Moscow Conservatory, the Svetlanov Hall of Moscow International Music House), in Russian cities and abroad. Participant of St. Petersburg Music House programs since 2018.